Puja Mandala is one coherent religious houses area. In one line standing sweetly Ibnu Batutah Mosque, Maria Mother all Nation Catholic church, Budhina Guna Vihara (temple), Hills of Pray Protestant Christian church, and Jagat Natha Pura. All figure a harmony lives among people with different religions. Puja Mandala come from sanscrit languange. Puja means pray. Mandala is an area or region. So, Puja Mandala is one harmony area for people from different religion to pray. Puja Mandala is located in Nusa Dua, Bali. The spirit of living harmony among people with different religions exist here. On a Christmas, the christian makes various ornaments for church. People other religion help for management parking area. The Moslem friends contribute to play angklung (bamboo ethnic music of Nusantara-Indonesia). On Nyepi day (Hindu’s day),the moslem people pray at the mosque quitely without peal the adzan. Ekaristi day (Budhi’s day) heard adzan magrib peacefully. The harmony living among people different religions has decrease. This what we’ve to realize. My journey in Nusa Dua Bali to this Puja Mandala, seems remain me to my life when i was a child. 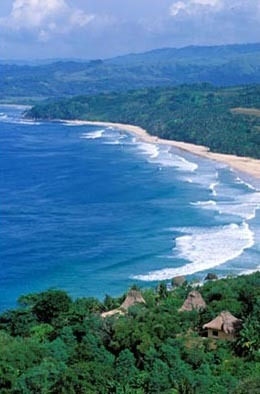 It’s a place where i lived which is: Sumba. An exotic island, in east Indonesia. Which full of steppa (grass fields), horses , hills, earthquake, soil land but full of rock, ancestor worship, the ancient tribes, stone-tomb, betel vine & areca nut, and spirit of Lebaran/Idul Fitri (Moeslem’s day) & Christmas day! In Waingapu, a small town of the Sumba island. After Ied’s pray in morning, children from our housing area, wether moslem & and non moslem,we’re all together by walking visiting the other houses where the people inside celebrates Lebaran or Idul Fitri. We’re all cheerful & full of smile, even our trip quite far for little children like us.We went until Java village, Malay village, Arabic village. Sometime, we visited to people we don’t know before but we know they celebrate Idul Fitri just to congrate them. We din’t care we entertained by a lot of food, or given money or not at that moment. What’s in our mind was only to give lebaran’s congratulation and visiting one house to another houses with smiley faces … Ow what a pleasure feeling for all of us. At the evening, we return home. Our stomach also full with kinds of food. Ah…we never forget to bring some candies & nuts from our visiting. What kind of children who don’t like candies & nuts? Ha ha ha. Quite different at Christmas day. Most of the students in our school were Christian. Therefore we celebrated Christmas at school in a theater performance. All student want to participated. Some as the actors,some as the vocal group, some as committee of the event. And the rest are the audience, including the teachers. All mutually involved & help each other. In the middle of the theather performance, sometime we’re all laughing together. Because the actors made some mistakes in saying the naration. It’s ok for the audience. There is a cheerfull spirit from us as students. We never learn to mock or insult. 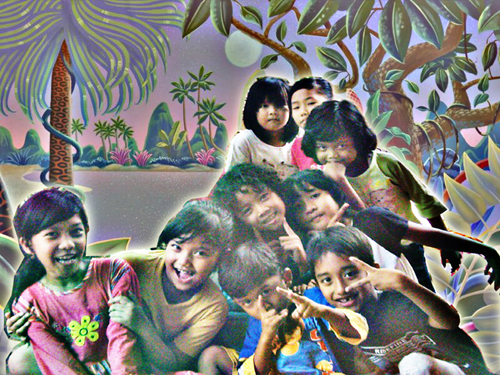 With children soul innocence,naturally we just learn lo have respect each others, love to others, & help each others. Pick a lesson from this journey is, can we have pure soul just like the children soul? We can mirror on our children innocence. The innocence without assessing & judgment. Life & respect others. Help each others. Walking together with our hands holding each others. Laughing & joy together. Love and to be loved. Sampurasun. Best wishes. Shalom. Om Swastiastu. kulonuwun. Wassalam.